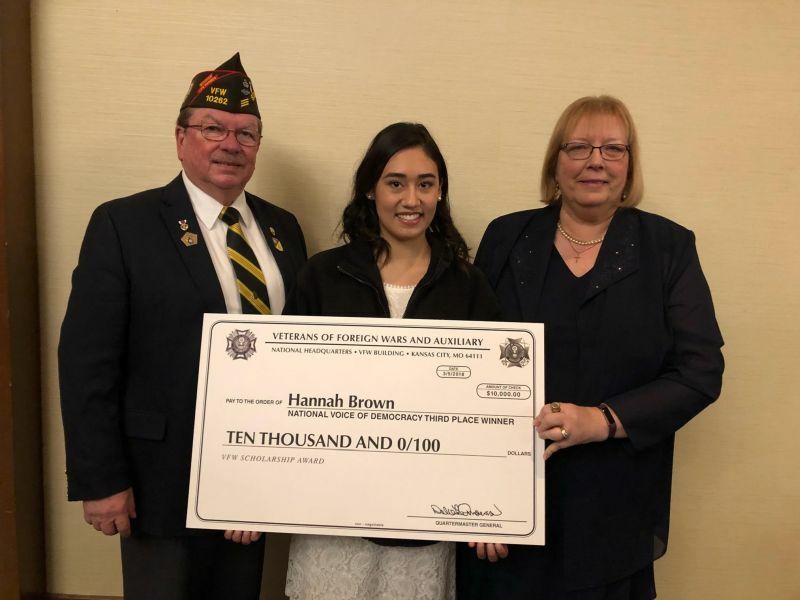 The Department of Wisconsin’s 2018 Voice of Democracy First Place Winner Hannah Brown has earned Third Place in the National Competition, garnering her the $10,000 VFW Scholarship. The award was announced during the Parade of Winners held annually on Monday evening at the VFW National Legislative Conference in Washington, D.C. Sponsored by VFW Post and Auxiliary 1039 in Menomonie (District 9), Hannah is a home-schooled 12thgrader and the daughter of Kurt and Sophia Brown of Menomonie. If Hannah looks rather "familiar” to you, it is probably because she very closely resembles our 2017 Wisconsin First Place Winner, her older sister Sarah Brown. Following completion of her High School studies this spring, Hannah plans on attending the South Carolina School of the Arts at Anderson University in Anderson, South Carolina to major in Graphic Design. She and her father recently visited the University for a very competitive two-day process of interviews and activities, where Hannah was one of 60 students out of 470 applicants invited to apply for a President’s Level Founders Scholarship. The process included a very intense portfolio review of 15-20 projects; personal interview; group project sessions and other activities, as well as the opportunity to stay on campus with current School of the Arts students. Just before leaving for Washington, D.C., Hannah received word that she has been awarded a full tuition scholarship to the University as well as an additional renewable partial scholarship. In addition, Hannah is looking forward to being part of the University’s Honors Program. What great accomplishments to add to her growing list of successes! Congratulations to Hannah and the entire Brown family, VFW Post and Auxiliary 1039 and Department Scholarship Chairmen John Kleinmaus and Mary Brown on a JOB WELL DONE! And all the best to you Hannah – we know you will do well at Anderson University! For the text of Hannah’s essay and additional information on this year’s very successful Voice of Democracy and Patriot’s Pen programs in Wisconsin, please see the center pages of the March/April WI VFW NEWS. With thanks to John Kleinmaus for the Monday night call; Sr. Vice Commander Gundel Metz for the photo and "Proud Papa” Kurt Brown for the college info.